Texas has one Indian casino and six large race tracks. The minimum age to gamble is 21. For Vegas type casino gambling most Texans drive to the adjacent states of Oklahoma, Louisiana or New Mexico. The casino pages have pictures, gaming details for slots, baccarat, blackjack, poker, craps, roulette and other table games. The Kickapoo Lucky Eagle Casino offers Class II gaming machines. For table games the player must pay a house commission for every hand played. Texas has one greyhound track and five horse tracks. There is currently a lot of debate about adding video gaming machines to the tracks. Texas is a large state with much to see and many great Tex-Mex restaurants. For travel information visit www.traveltex.com or call 800-888-8TEX. Lone Star Park Race Track in Grand Prairie, Texas features live quarter and thoroughbred horse racing in the spring April - July and the fall schedule is September - November. Open daily at 10:30am for simulcast wagers. Valley Race Park in Harlingen, Texas features live greyhound racing and is open daily at 11am-1am for national simulcast races. Sam Houston Race Park in Houston, Texas offers live quarter and thoroughbred horse racing on two tracks. Open daily 8:30am-11pm for national simulcast. Gulf Greyhound Park in La Marque, Texas features live greyhound races on a quarter mile sand track. Live racing Thursday and Saturday 7pm, Wednesday at noon, Saturday and Sunday 1:30pm. The track opens daily at 11am for simulcast. 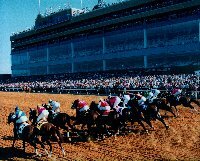 Manor Downs Race Track in Manor, Texas features live quarter and thoroughbred horse races March - April and is open at 11:30am-11:30pm for national simulcast. Retama Park Race Track in Selma, Texas features liver quarter and thoroughbred horse racing on two tracks and is open daily at 10:30am for national simulcast.